The Reflections program is sponsored by the National PTA to promote and encourage artistic creativity both in the classroom and at home. The purpose of this program is to provide an opportunity for students to showcase their creative talents in a nationally acclaimed student recognition program. Membership in TYEE PTSA allows students to submit an entry to be considered in this National arts competition. Any students with disabilities may receive special accommodations by entering the special artist division and are encouraged to enter any category. REFLECT on the theme. CREATE art. BE RECOGNIZED! 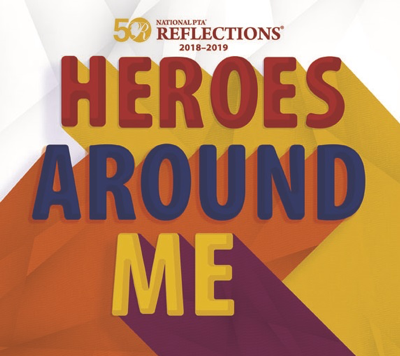 Think about this year’s theme, “Heroes Around Me” and how you can express the theme within your art category of choice. Judges review student submissions on interpretation of the theme, explanation as noted in the artist statement and finally, the creative ability. The Entry Form must be signed by both a parent and the student, and attached to the artwork in a plastic sleeve provided by the applicant. PTSA Membership is required. Submission Deadline is November 8, 2018. Further details for drop off will be communicated at a later date. Please feel free to contact Reflections Chair, Ashley Aass with any questions mailto:reflections@tyeeptsa.org.